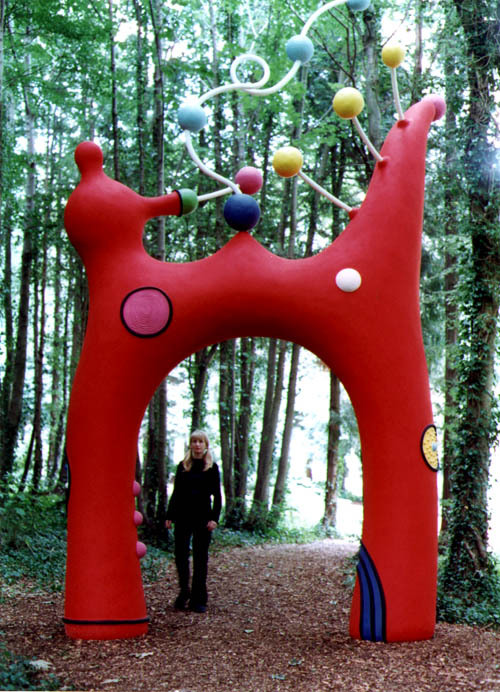 In 2000 Wilfred and Jeanette Cass asked us to make a sculpture for their sculpture organisation ‘Sculpture at Goodwood’. We made several models of different ideas which were to be sited in different places in the grounds and finally settled on ‘Chase Air’. There were many thoughts and threads that lead us to the final design and siting; among them were the tale of Daphne and Apollo (the psychological strategy of taking yourself ‘out of body’ when faced with an unendurable experience struck a chord with us), the experience of seeing blue sky through a woodland canopy, immersion in colour (like a bee in a flower), the merging of male and female and other thoughts and feelings that occur subconsciously while working which are hard to put into words and probably best left untranslated. Ann Elliott wrote this in ‘A Vision for 21st C. British Sculpture’, which we thought was good. “Rutter and Bennett have worked in collaboration on sculptures since 1994, having respectively pursued independent careers in the fields of sculpture and architectural stone carving, and textile and ceramic design. Working together in a truly democratic manner has, for these artists, had the effect of eliminating egocentricity in their thinking and has assisted creative problem-solving. Theirs is a true partnership of complementary ideas, skills and sensibilities which results in sculptures that are highly individual as well as colourful and accessible. 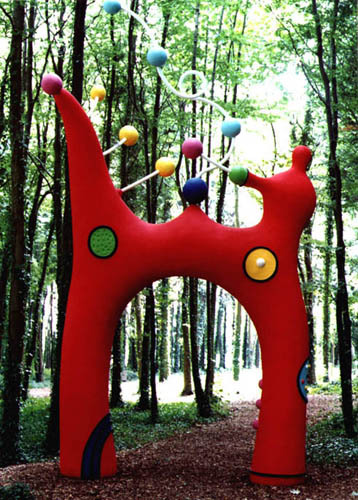 The circus, which has engaged the interest of artists as diverse as Degas, Calder and even Henry Moore in some of his graphic works, has been the source of many dynamic and joyful sculptures by Rutter and Bennett. 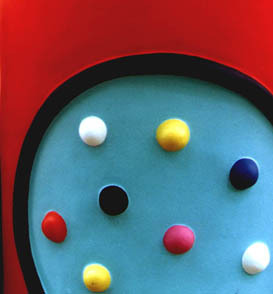 Colours of the sweet jar and dressing-up box are applied evenly to the surface of their sculptures and work entirely in harmony with the form. ‘Chase Air’ was sold to Prior’s Court School for Autistic Children, which was founded by Dame Stephanie Shirley and has a wonderful art collection which helps the children. We are very glad it went to the school. Here is a video of the installation of the sculpture made by the SkyArts channel for the series ‘Walking with Sculptors’ . Try here if the first video is not working.